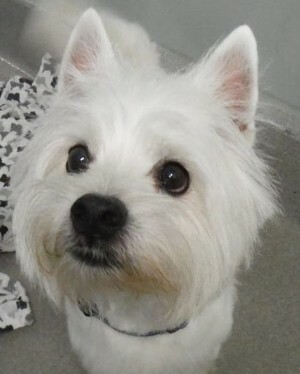 Westies in Need (WiN) works very hard to match our wonderful dogs with equally wonderful new families. Here are some of our success stories! One of our little rescues was named Lilly - she was the worst case of skin problems we had ever seen when she arrived into our rescue program. The Pet Network saw her info on our website and asked if they could do a story on our Lilly and our rescue. Click here to watch the video of Lilly and her journey...they did a great job and we can't thank the Pet Network enough for supporting us! Lilly says THANKS too! 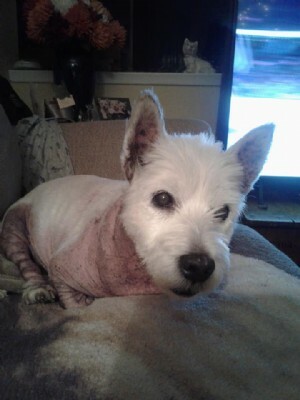 A heart warming WELCOME to 8 yr old Willie ... his story will bring tears of sad & happy! Willie was left at the vet for euthanasia (skin issues) and thankfully the vet office reached out to WiN to ask if we'd take this very sweet boy!! Thank you to Angela & Ian for picking up this darling boy and fostering, falling in LOVE. Willie was neutered today and will be showered with love as he recovers and settles in, to enjoy his new found life as a Prince. An update...Willie has been adopted. He met hs new foster family and asked if he could stay forever and they said YES!!! This darling owner surrender is just 6 years old and has come to us when his owner passed away. This handsome boy is in foster care right now and we will move forward to find him the very best new home. Darling Cosmo is not quite 2 years old and comes to us as an owner surrender. This very sweet and handsome boy is in foster care and I am sure it will not be too long until he finds his new and "fur"ever home. An update...Cosmo has been adopted! He met Christopher and Star and just knew they were the perfect family for him! Welcome our 3 newest arrivals! These 4 month old sweeties were rescued from a puppy mill and are now safe in our rescue. An update...Robbie, Harry and Meghan have been adopted. They met their new families and it was love at first sight!!! Alice and Maggie are owner surrenders to our rescue when their Mommy could no longer care for them. These 2 LOVELY girls are very bonded and must be adopted together. They are 10 years old and are as sweet and loving as can be! An update...Alice and Maggie have been adopted. This 2 girls found the most perfect home and are so happy that they have stayed together....and they even got a cottage as well to go to in the summer!!! 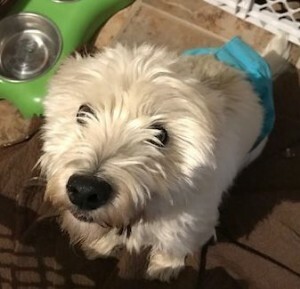 This sweet boy is truly a Westie in need and we thank his family for agreeing to surrender him to us so that we can get him the help he needs! If you have ever wondered why we do, what we do...Geordie is the reason!!!! 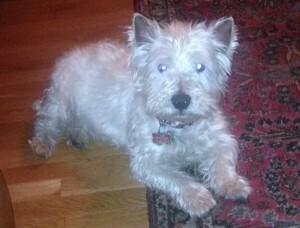 Geordie will be off to see the Vet ASAP and is in a wonderful foster home. Welcome Geordie....we love you and will take SUCH good care of you! An update...Geordie has been adopted. His skin is doing so much better and he found a perfect family and he even got a little brother, named Angus, to play with!!! Here is 2 year old Rhaegar....(pronounced Ray-Gar) This VERY handsome (as you can see) boy has come to us as an owner surrender and we can not thank his family enough for trusting in us to find him a new home. He is in a "foster to adopt" home with a family who have been on our wait list for quite a while and they are beyond thrilled. He is settling in great and is loving the snow in his big fenced backyard! An update...Rhaegar has been adopted. He met Alex and her family and he just knew it was the perfect new home for him. 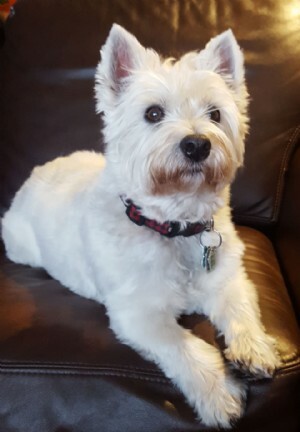 Felix is a 10 yr old, partially deaf Westie who found himself displaced when a tornado ripped through Gatineau, QC. A good samaritan rescued Felix from traffic and took him home where he was given to a neighbour who would care for him. Through social media WiN learned of Felix in the New Year and went to work at finding his owner. We were successful in finding his owner who surrendered Felix to our rescue to be placed in a home where he would get the attention he so deserved! An update...Felix has been adopted by his foster family. Congratulations Felix, you have just won the lottery, enjoy your new found life as a prince!!!! WELCOME Lolly! This super sweet 8 yr old, spayed female is an owner surrender and is happy to not have to share her home with a toddler. She is settling in very well with her foster family. She will be seeing our vet this week for a check-up. An update...Lolly has been adopted. She met her foster family and asked if she could stay forever and they said YES!!! Welcome Champ to our rescue. This darling 9 year old is a handsome man for sure and we will find him a wonderful new and "fur"ever home! An update...Champ has been adopted. 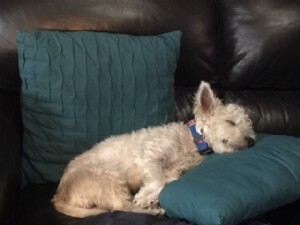 He met Sue and her family and he knew it was the perfect home for him! 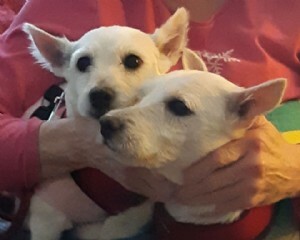 These 2 VERY sweet little darlings are just 4 years old and come to us from a puppy mill in Ohio. 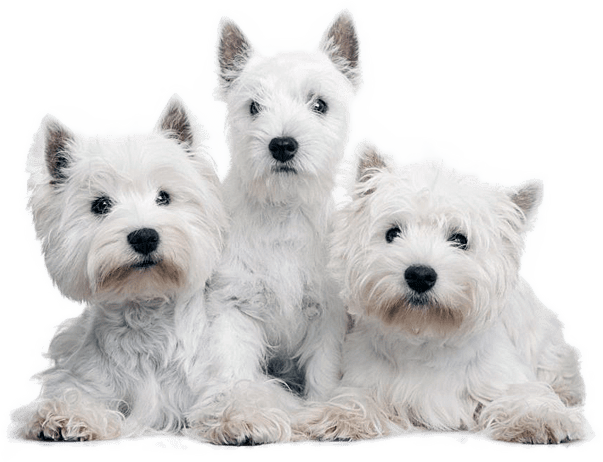 They were shaved down in the mill, but we sure know that fur grows and they will be in full Westie coats shortly! An update...both Carol and Sarah have been adopted. These 2 lucky girls have found wonderful new and "fur"ever homes. This little boy is just 4 months old and is just about as cute as can be! 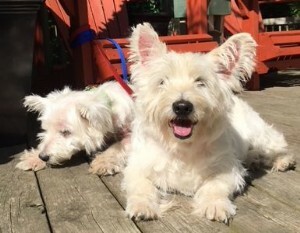 He is in foster care right now and having such a good time with his two new best friends, Westie girls who are teaching him the ropes for sure! An update...BuBu has been adopted. 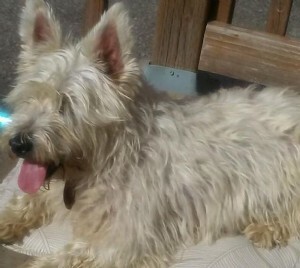 HIs new name will be Tucker and he even got 2 Westie sisters as well! Welcome to little Cole! He is just 11 months old and is a cutie for sure. He has been neutered and will be ready to join a new family shortly!!! An update...Cole has been adopted. 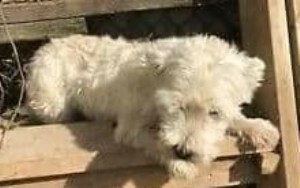 His new name will be McDuff and he knew he met the right family for him when he met Paul and Starlee!!!! Shorty is just 5 years old and comes to us as an owner surrender. He is the most loving and special boy...loves his walks and his snuggles! He is in foster care for a bit and we will find him a perfect home. Welcome Shorty!!! An update...Shorty has been adopted. He met Donna and her family and he just knew it was the perfect home for him!!!! 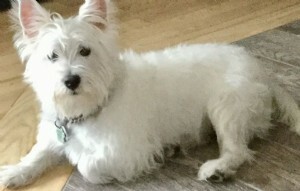 Welcome to little Zoe who is a 1 yr old owner surrender. This sweet girl is having a great time in her foster home and we will move quickly to move with finding her a "fur"ever home. An update...Zoe has been adopted. 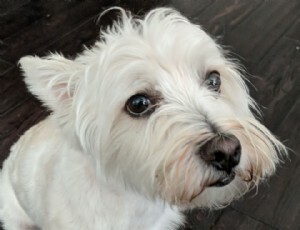 Zoe joins Mike and his family along with 9 year ol Westie, Maddie and 11 year old Jack Russell mix named Jack! 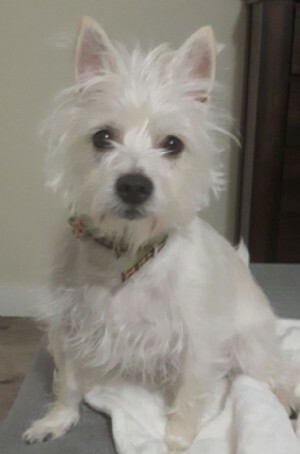 WELCOME to 4 yr old Azalee a little Westie mix. This darling girl is traumatized and terrified of everything!!!! She has spent most of her life (including the dead of winter) outdoors. An update...Azalee has been adopted. Her new name will be Amy and she and her Mommy make such a great team! Here is 4 month old Gracie. She is an owner surrender and we can not thank the family enough for trusting us to find her a new home. She is in foster care right now and we will be going through our many applications that have been waiting and will find her a perfect family! An update...Gracie has been adopted. She met her new family and just knew it was a perfect home for her! 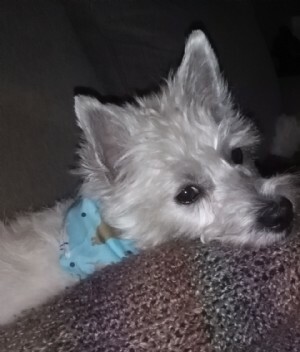 Darling Fraggle....this little girl just turned 4 years old and is an owner surrender. Our love and our thanks to her family for trusting us to find her a new home. She is in foster care right now as we go through all our current applications to find this sweetie the best new home! An update...Fraggle has been adopted. WELCOME “Queenie “ a 7yr old female who comes to us from a shelter in Quebec. An update...Queenie has been adopted. Her new name will will Cookie and when she met Nadine and her daughter, she knew she had found her forever family. 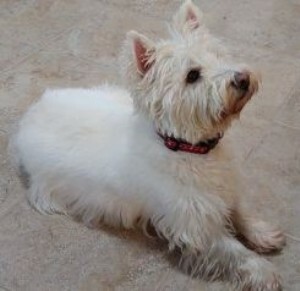 Princess is fostering in Quebec and will be spayed very soon! An update...Princess has been adopted. She met her new family and just knew it was the perfect "fur"ever home for her. 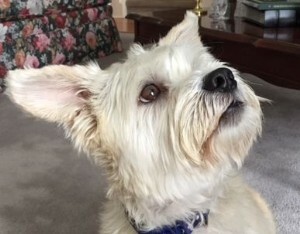 A warm WELCOME to 8 yr old George who comes to us from the Ottawa Humane Society. This super friendly little guy found himself alone when his owner passed away. George needs some dental work but more importantly he has a nasty growth that needs removal/testing ... you're in good hands now little one, we'll get you in to see our vet ASAP!!! An update...George has been adopted. He and his new family are so happy!!!! Cotton has come to us as an owner surrender. She is just 5 years old and is as sweet as can be! 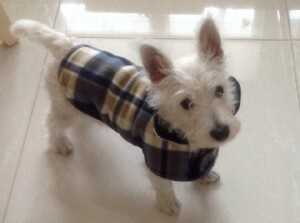 Our love and our thanks to her previous family who reached out to us for help finding Cotton a new and forever home!!! An update...Cotton has been adopted. She and Caroline make such a perfect pair! Adorable Molly has come to us as an owner surrender. Our love and thanks to her family for trusting us to find her a wonderful new home. 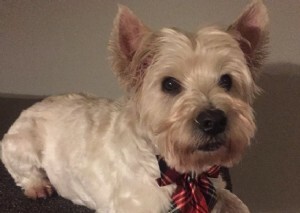 5 year old Molly is is a Westie/Yorkshire terrier mix and is, as you can see, as cut and sweet as can be. An update...Molly has been adopted. 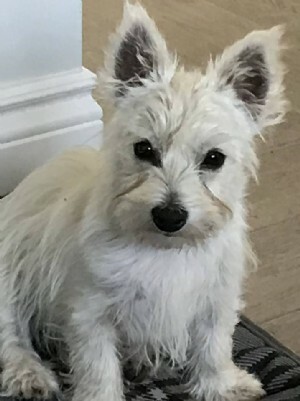 She met Vicki and just knew that she was going to be her forever Mommy and she even got a new baby Westie sister to play with! 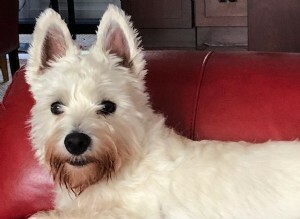 Jock is just 2 years old and comes to us as an owner surrender. He is, as you can see, a very handsome young man who is having lots of fun in his foster home! He is neutered, very sweet and a good cuddler! 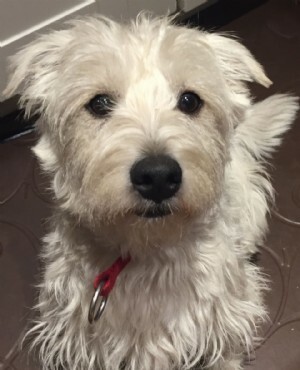 An update...Jock has been adopted. 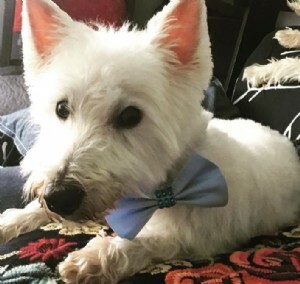 He met his forever family and just knew it was the perfect home for him! Luke and Maggie are both 10 years old and are brother and sister. They have come to us as an owner surrender when their Daddy passed away and the family asked for us help. These 2 will be adopted together, as they are a bonded pair! An update...Luke and Maggie have been adopted. 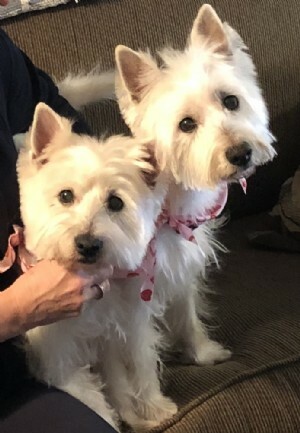 This VERY sweet and bonded pair will be living with Jim and Judy as thier new family! 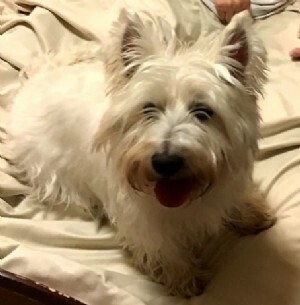 Buddy has come to us as an owner surrender. He is 4 years old and is such a great boy. He would do best in a home with no other dog. 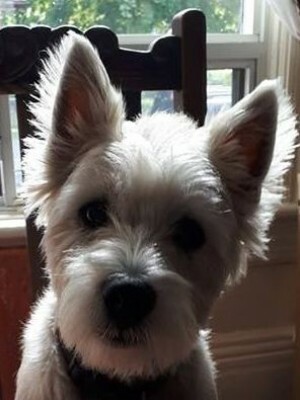 Welcome Buddy to Westies in Need! An update...Buddy has been adopted. He met Claire and her family and he knew they were the perfect family for him!!! Sweet Lucy is just 17 months old and comes to us as an oner surrender. Our love and thanks to her family for reaching out to us and asking for help in finding her the perfect home! An update...Lucy has been adopted. She met her new family and just knew they were a perfect fit! Congratulations to Kelly and her family! Howie was a stray found wandering and was picked up by animal services. The shelter called us right away and asked if we could help this sweet little boy and of course we said yes!!!! He is 1 1/2 years old, neutered and is such a happy guy. 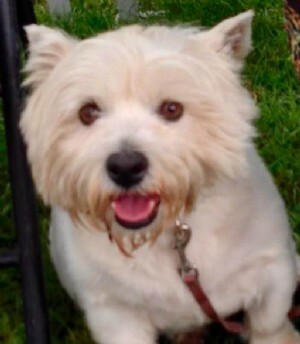 Welcome Howie to Westies in Need. An update...Howie has been adopted. This beyond sweet and very lovy boy is now living with Debbie and loving it!!! 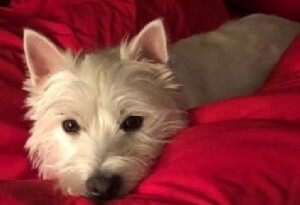 Please give a warm Westies in Need welcome to our newest rescue Coqueta (which is Spanish and translates to Flirt ) This darling 5 year old girl is in a foster to adopt home and is having a blast!!! Welcome little girl to WiN!!!! An update...Coqueta has been adopted. She has found the perfect home! Phoebe is 7 years old and as you can see, is as cute as can be! This is SUCH a lovely girl. She rides great in the car and is a wonderful snuggler!!! An update...Phoebe has been adopted. Her new name will be Maggie and she sure is one happy girl to join Roy and his family! 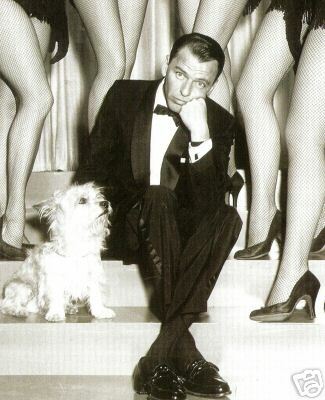 ... but when we found this old picture of Frank Sinatra with a sweet little Westie, we just knew we had to put it on our website, somewhere!! !